Sloppy Joe pockets are a refined version of this classic comfort food. 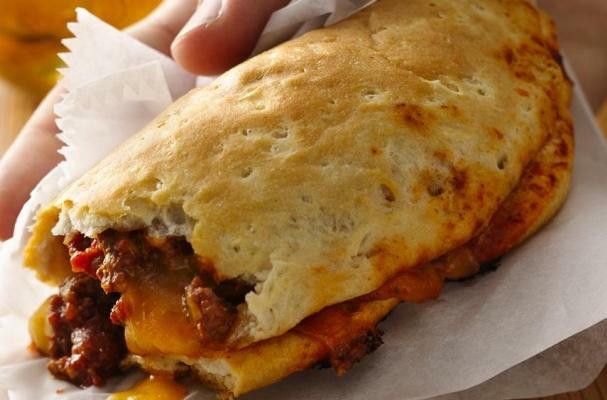 Instead of piling a thick, tomato based meat sauce on a bun, it's tucked neatly into a buttery biscuit - you could call it the American version of the calzone. Right before baking, I like to brush some garlic butter over the top of the biscuits to give these pockets another layer of flavor. For a vegetarian variation of this dish, swap out the ground beef for soy chorizo or scrambled tofu and add chopped mushroom, frozen spinach (the has been defrosted and excess liquid removed), and zucchini. Truth be told, you can add the vegetables regardless if you're cooking a vegetarian version or not. For those of you still craving barbecue, mix the ground beef with your favorite barbecue sauce for a different take on these sloppy Joe pockets. No matter how you prepare them, your family is going to love this quick and easy meal. Heat oven to 375° F. In large skillet, cook ground beef over medium-high heat until beef is thoroughly cooked, stirring frequently; drain. Stir in sauce and chili powder; simmer 5 minutes. Press each biscuit into 6-inch round. Spoon 1/3 cup meat mixture and about 1 tablespoon cheese onto center of each round. Fold dough in half over filling; press to seal. Place on ungreased cookie sheet.